Create valuable vertical space with this sleek-looking shelving unit from FCH. Combining contemporary good looks with a conveniently adjustable design. A useful addition to any living space or storage area, the shelving unit offers remarkable strength, convenience, and versatility. 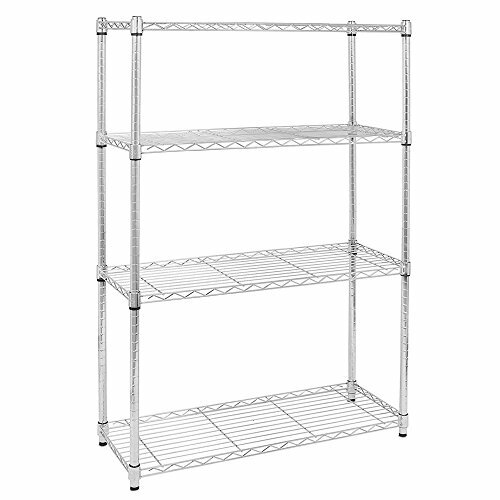 DURABLE MATERIAL FOR LONG TIME USE: Constructed of durable steel with a gleaming chrome finish, the stylish four-shelf shelving unit offers the best of both rugged reliability and modern appeal. ADJUSTABLE-HEIGHT SHELVES: Simply clip together the two-part, black, plastic sleeves around the posts and at the height you want the shelf to sit. With four sleeves in place on each post and at equal height, lower the shelf down into place. Raise the shelf and move all four sleeves to a new position for more or less height, as desired. The sleeves can be placed higher or lower in 1-inch increments for ultimate customization. WORKS ANYWHERE: Placed in the kitchen, It can hold canned goods and bulk items to pots and pans, stand mixers, dishes, and bowls. In the living room, it can also store books, magazines, board games, and more. In an office setting, it can help keep files, documents, and supplies neatly organized. It can stand in any place where has limited room while requires large storage space,such as bathroom, doorway, entryway, garage, kitchen, pantry, laundry, office or closet. SPACE SAVING STORAGE: Without occupying too much space,its perfect size of 35 1/2" W x 13 3/4" D x 47 1/4" H makes it more suitable for small place storage. Each shelf holds up to 110 pounds, Total max load weight with leveling feet is 440 lbs.